Buildings, tall structures and wind turbines can interfere with radar systems. Interference typically occurs due to radar signals being blocked or reflected – which can cause a reduction in radar performance. 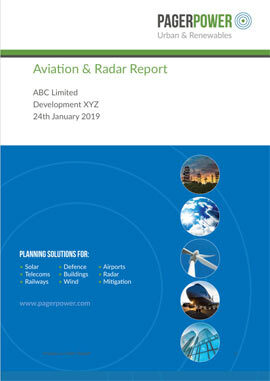 Our free online Aviation Risk Assessment report will enable you to assess the impact that a proposed development might have on an aviation radar system. The results can be used to make more informed decisions about the best places to consider for your development. The report allows you to input selected locations which might be suitable for your development project and the results will inform you of proximity to a specific airbase radar. You can also check whether a known radar will be in the line of sight of your development project. Just input the coordinates as well as height of the development into the form below. Once you have completed the form, hit the submit button and your report will be emailed to you. Thank you for requesting your Aviation & Radar report. Delivery time is dependent on how busy our assessment server is. Your report should be dispatched to your inbox within the next hour. Any problems please be in contact. There has been an error in generating your report.